In all the welter of charge and counter-charge about the welfare reform bill fiasco one set of circumstances stands out. Sinn Fein has been pursuing the DUP since February 25 to try to find out the precise proposals of the Department of Social Development and the DUP has been dodging and weaving. No, worse than that, the DUP has refused to disclose the detail. When Peter Robinson said the figures were in the Financial Annex of the Stormont House Agreement he was being economical with the actualite. In fact there’s no detail in the five-page Financial Annex about how claimants, current or future, would be protected, nor would you expect any in a broad agreement because such details certainly couldn’t have been concocted the day before Christmas Eve. The figures in the annex are all global sums. The nitty-gritty was to be worked out by officials to become schedules to the welfare reform bill. Those figures began to emerge in the last week of February with five schemes to mitigate the impact of welfare cuts. These were to be put out for public consultation in March. It was at this point that Sinn Fein smelt a rat because schemes they got sight of (probably unintentionally) did not protect future claimants and also led Sinn Fein officials to be concerned about how the benefit cap would affect large families. 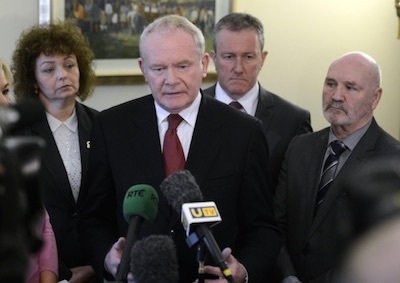 Since last Wednesday Sinn Fein tried repeatedly to see the detail but the DUP wouldn’t let them, including bringing Martin McGuinness on a wild goose chase from Derry. You have to ask yourself why. That is the central point. The answer is obvious. The DUP knew Sinn Fein would not accept the details of the five schemes. What the DUP planned was to push through the bill on Monday with an ‘enabling clause’ added allowing the DSD to implement the schemes. By that stage it would be too late to change the details of how the schemes for mitigating the impact of cuts would operate. As Martin McGuinness said, it was subterfuge. The DUP has been caught on. Sinn Fein blocked the bill. Now the question is, will Stormont fall? The answer is no and not just because the consistently wrong leader of the UUP said it would fall. The Stormont House Agreement is still in place. The global figures are still in place. Essentially the dispute is simply a sign of what is to come with the other aspects of the agreement: flags, Orange marches and the past. Does anyone think there will be ready consensus on any of those matters? What’s going to happen now is what should have happened a month ago. Sinn Fein and the DUP officials are going to have to sit round a table and hammer out the detail of the schemes announced in February to ensure they abide by the spirit of the agreement signed in December. No-one is looking for any more money. That’s not what’s at issue. The global sums have been agreed and are in the Financial Annex. What is now required is that Sinn Fein and the DUP produce an agreed set of schemes so that the enabling clause can be added to the bill. Secondly Sinn Fein needs to remember the remark attributed to several nineteenth century figures but probably first said by Wendell Phillips, the American anti-slavery campaigner, “The price of liberty is eternal vigilance; power is ever stealing from the many to the few.” What we need to see are the DSD proposals as they stood on Monday which so alarmed Sinn Fein. It wouldn’t take too long to work out how much the DUP was planning to take from the poor and disabled.